Kalamkari Printed Sling Bag . Kalamkari Sling Bag . 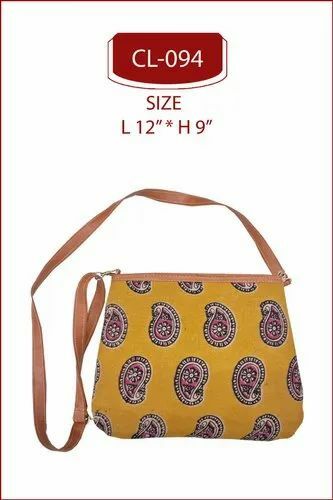 Size L 12" *H 9"
Kalamkari printed sling bags is made on soft cotton fabric with contrast color rexin material pipin all over. Designer printed sling bag has a perfect indo western look with bright colors option available. Designer sling bags, Printed sling bags, Cotton sling bags, Western look sling bags, Big size sling bags, Ladies sling bags, sling bags for womens, sling bags for girls. Established in the year 1990, Shree Shyam Baba Textiles is a highly recognized Manufacturer, Wholesaler and Supplier of Bangles Box and Pouches, Saree and Blouse Cover, Cosmetic Pouches, Shagun Envelopes, Clutches and Handbags, Jewellery Pouches and Boxes, Baby Bags and Potli Bags. With our expertise, advanced amenities and superior efforts, we are able to provide wide varieties of attractive products. These are superior in quality, advanced in variety and are high in demand. We maintain state of art facilities and broad marketing network which help us to supply our superlative products at the leading market price range. We maintain the quality and finishing in our products. We are in process to get Maximum Client Satisfaction. Kindly fill this form for get more details regarding prices.